We manufacture and supply a wide range of Ultrasonic Sm 65 US. These ultrasonic machines are sourced from quality raw material to deliver value to our customers. 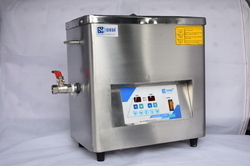 Industrial Ultrasonic Cleaning Machine is a two chamber or three chamber cleaning machine consisting of ultrasonic tank, drying tank and rinsing tank. The objects are dried in the drying tank by means of high pressure blower which is used to blow hot air inside the tank. These machines are used in a number of industries and are made available as per the set industry protocols. Looking for Industrial Ultrasonic Cleaning Machines ?